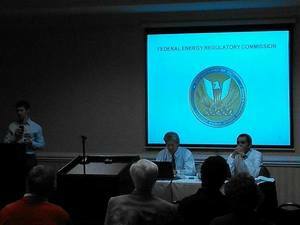 FERC is less transparent about a $3 billion project than a local library board was about a $10 million project. Last night in Valdosta FERC again failed to provide the RFP used in selecting the environmental contractor to be used on all three of the proposed connected methane pipelines. I’ve never heard of any other tax-funded agency refusing to release an RFP of which they have a copy. Have you? FERC Kevin Bowman environmental protection specialist (pictured on the left) said he’d never heard anyone request an RFP before. He should talk to his FERC co-worker John Peconom (pictured on the right), because, as I mentioned when I stood up to talk, Peconom had already refused to release that RFP. Those of us property owners who are already Spectra Energy “stakeholders” (the company’s term), want Spectra Energy to be the best it can be, consistent with its publicly stated commitment to Stakeholder Engagement, Integrity, Transparency, and Accountability. FACT: I speak for more than a dozen families who live next to or near the problematic compressor facility; and your statement is incorrect and misleading. What facts do you have to support such a disingenuous allegation? A ring of health, water and operational complaints surround this facility that began operations in 2009. Based on unofficial record keeping by neighbors, there have been nearly 60 shutdowns, blowdowns and related incidents at the Steckman Ridge compressor station and underground natural gas storage facility between August 2009 and the present. And there is much more, as you know. • You assert that uncontrolled releases of methane and other hydrocarbons that happen too frequently at the Steckman Ridge compressor facility are “normal.” Let’s hope not. Your assertion is uninformed and misleading.